Note: There has been a considerable gap of time since our last post from the Arctic. This year we are working with our research partners to review blogs, press releases and other documents for accuracy and completeness and this process can take time. The events of this post and the next one take place in late June and early July 2018. We will have the next post up shortly. Thank you for your patience. Nesting shorebirds act suspicious. Sometimes this is obvious with alarm calls or distraction displays designed to grab a predator’s attention and lead it away from the nest. Often it is much more subtle, especially early in the incubation cycle. A Semipalmated Sandpiper or Dunlin with a new nest might sneak off through the sedge as you approach, only to pop up on a nearby mound and preen or start to forage for food. They look like any other sandpiper on the landscape except that they are watching you. You can see it in the tilt of their head or the way they run away only to pop up and stare at you again. A bird without a nest will usually either ignore you entirely or just fly off. This banded Semipalmated Sandpiper watches us intently as we search for her nest. Dunlin are experts at nest concealment and deception. This one is not pleased that we finally found his nest. Of course, suspecting that a bird has a nest is only the first step. Then you either have a painstaking search for perfectly camouflaged eggs in a dense cover of sedge and grass or more often, a retreat to a good vantage point to hold still and wait for the bird to make his or her way carefully back to the nest cup. Good nest-finding skills are essential for our work up here on the Canning River. We are trying to retrieve satellite transmitter put out in previous years and deploy new tags on several shorebird species. In both cases, we need to catch the bird, and trapping at the nest is the quickest and most reliable way to do that. We use mesh bow nets that pop over the nesting bird and are easy to use, safe for the bird and eggs, and very reliable. 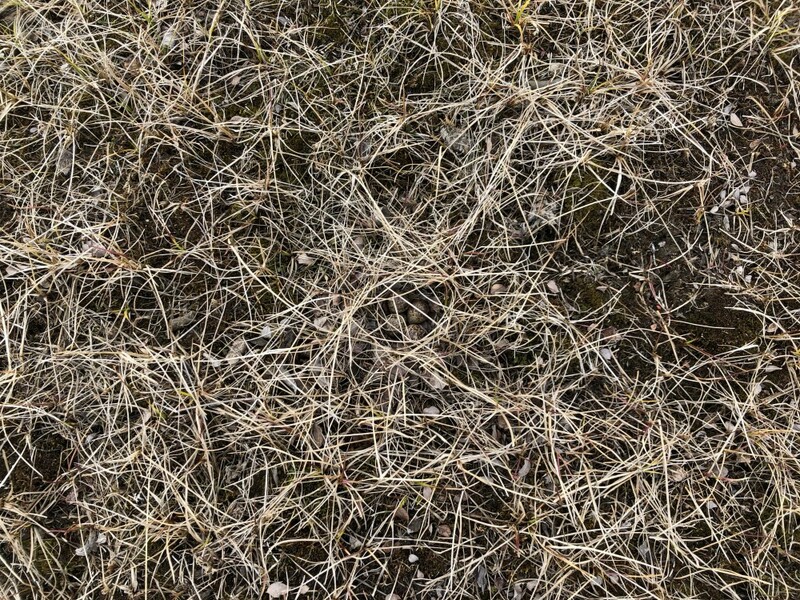 But first, we have to find the nests. Look carefully to see the little Semipalmated Sandpiper nest in this photo. This photo was taken from 3 feet directly above the nest. You can see why extreme care and good eyesight is needed when searching for these eggs. 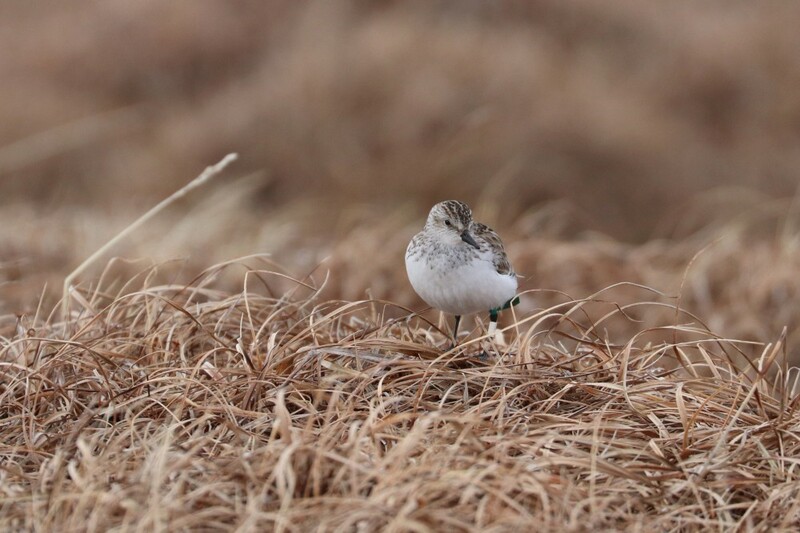 In addition to deploying satellite transmitters to track post-breeding and migration movements, we are working with the US Fish and Wildlife Service on a large, long-term study of nesting shorebirds and waterbirds on the Arctic coastal plain. By thoroughly searching our study area for nesting birds we can track changes in which species are using the Refuge, monitor bird abundance, and estimate nest survival rates. Lisa Kennedy tries to pick up a signal so she can mark the location and information on a new Dunlin nest in our database. The signal works about 70% of the time so the system is still a work in progress. This year the late snowstorms and deep snow base have significantly delayed the start of the nesting season. When we arrived two weeks ago we were already very late getting into camp due to weather. Normally the 13th would be the peak of egg-laying, but when we arrived the snow cover was still almost 100% and we saw very little evidence of nesting behavior, let alone nests on the ground. Nesting ramped up quickly as soon as the snow started to melt, but for some species, it may be too late. 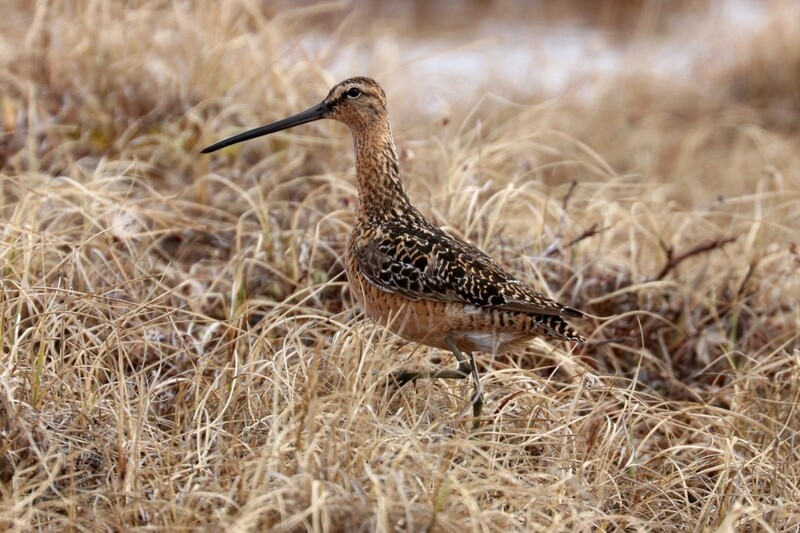 We have already noticed flocks of Long-billed Dowitchers gathering up as they do before migration. Long-billed Dowitchers are regular nesters on the study area, but we have found no nests this year and many are already flocking up and preparing to leave. The late storms and heavy snow may mean a failed nesting season for this species. 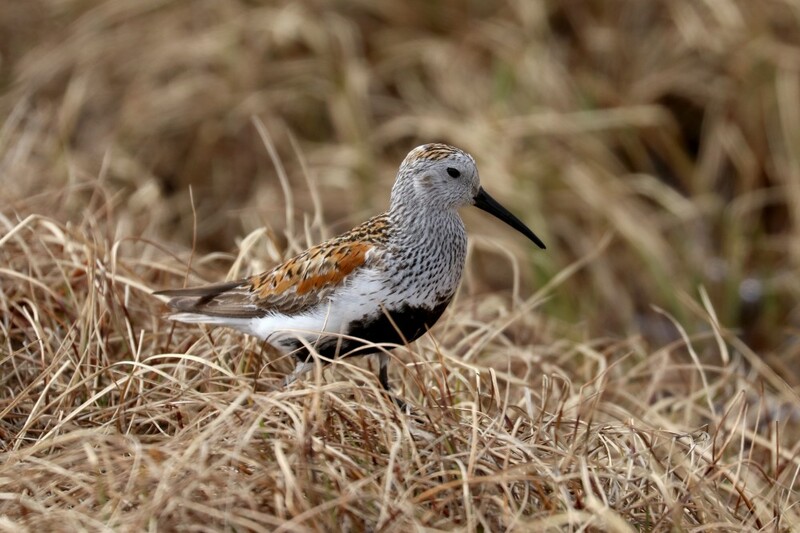 Other species such as Dunlin and Pectoral Sandpipers are nesting but much later than normal. This likely will mean that they only get one shot at nesting this year because if anything happens to the nest they will probably not have time to try again before the short Arctic summer is over. As a result of the weather delays getting into camp and the strange nesting season, our work is considerably more challenging this year. We have only seen a couple of the birds we tagged last year and so far have not been able to find their nests and retrieve transmitters. It is possible that this is a result of the poor nesting conditions on the Canning this year, but it makes the rest of our work more critical. Unlike the transmitters we put out last year, the new devices upload directly to the satellites and do not need to be retrieved the following year to download data. They will degrade and fall off the birds after the batteries run out. This year we are attempting to catch Pectoral Sandpipers and American Golden-Plovers. A male Pectoral Sandpiper inflates his air pouch as part of a mating display to a nearby female. 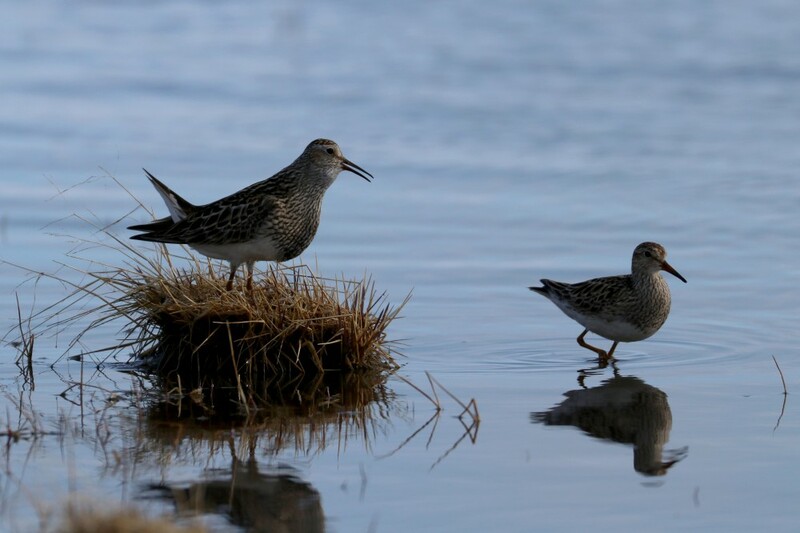 Pectoral Sandpipers are one of the more abundant nesting species and their deep hoots form part of the background sound of the Arctic summer. 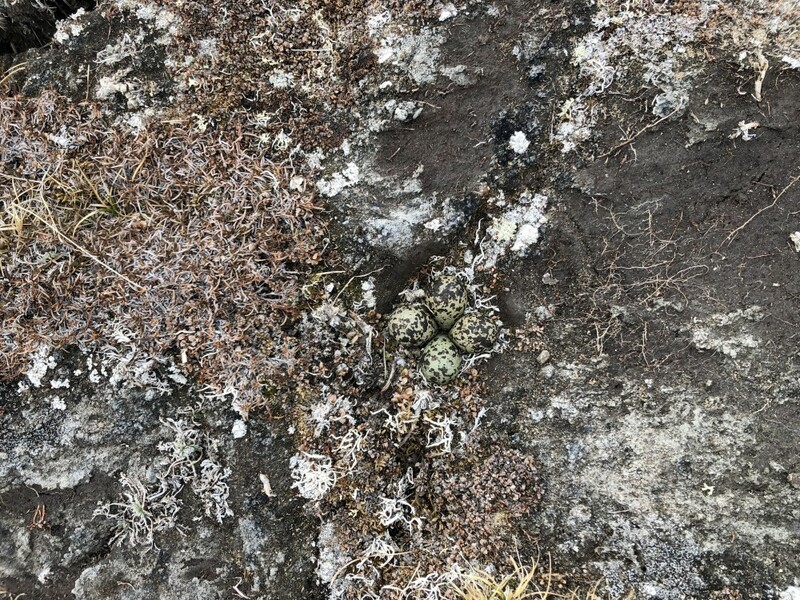 Plover nests are more exposed than sandpiper nests, but these Black-bellied Plover eggs are still perfectly camouflaged with the surrounding moss and lichen. While the Pectoral Sandpiper trapping has been a success, we have a shortage of Golden-Plovers on the study area this year. The one nest we found was eaten by a fox within 24 hours and we have few new prospects at the moment. 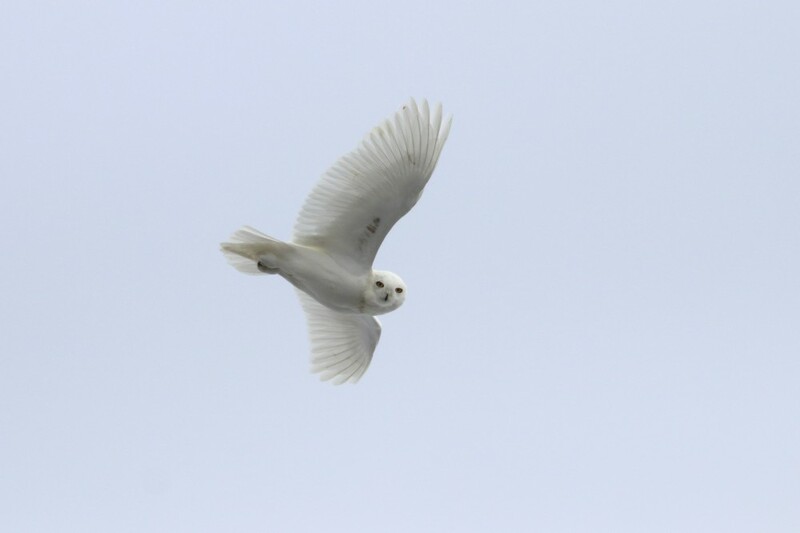 It is possible that the abundant Snowy Owls on the study area this year are keeping the plovers off their normal nesting areas as the two species seem to prefer similar habitat for nesting. 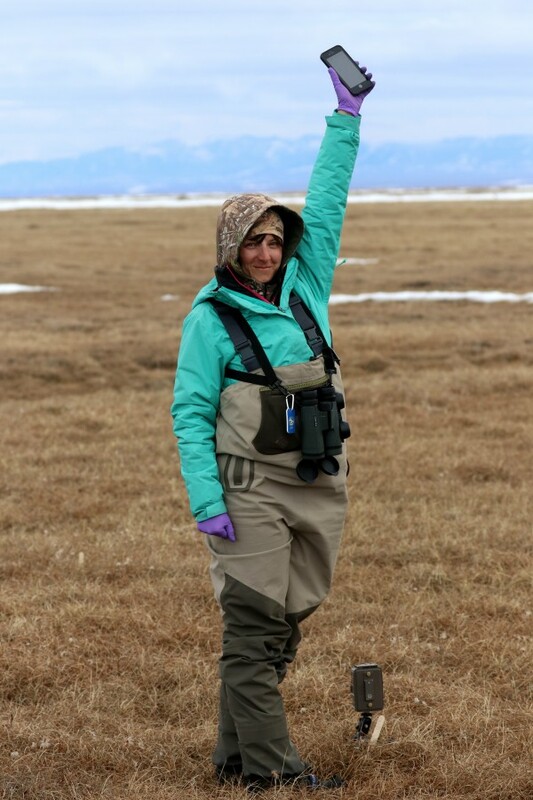 In our next post, Shilo Felton, a recent Ph.D. graduate from North Carolina State will describe our search for Plover nests and her experience as a new researcher in the Arctic. The lemming population has exploded and Snowy Owls are everywhere this year, taking advantage of the food bonanza to feed their young. Such a tough season. What amazing perseverance by birds and researchers alike! That Semipalmated Sandpiper nest is hidden so well, I have new appreciation for those who carefully find them.